The Fearless Farm Frau: BACON!! My husband is a confirmed bacon addict. Being German, I prefer sausage, but bacon has its place. Heck, we're talking about the man who wrapped a corn dog in bacon and deep fried the whole shebang. So I was pretty tickled when I finally found him the perfect Father's Day gift. He's pretty hard to shop for, especially when we're on a tight budget. I wanted to get him a new chainsaw, or a chipper/shredder. Well, that wasn't quite in the cards. Who wouldn't love this? And, there are easier ways than drilling holes in your nice muffin tins. You can use votive candle cups (with holes punched in) or tinfoil cones. AWESOME!!! I was so jazzed about this that I couldn't wait to surprise him. Well, now he knows what he's gonna get. I'm pretty sure he'll like it. 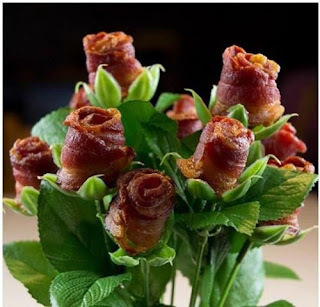 Folks, give the bacon lover in your life something special--a bacon rose bouquet!